The traveling library exhibit, Benjamin Franklin: In Search of a Better World, gives public audiences the opportunity to explore and to talk about Franklin's life, his contributions to the founding of this country, and his high standards for work, citizenship, and contribution to community. It looks at his background, his self-education, and his philosophical and religious beliefs and their effect on his work and life. It shows Franklin in the context of the eighteenth century and as a product of his times — a brilliant and rather unconventional product of his times — rather than as the venerable bespectacled and grandfatherly figure with whom we are all familiar. The panel exhibit consists of six sections of colorful, freestanding photo-panels, incorporating representations of artifacts from the original Franklin exhibition and a text written by the curator of the original international traveling exhibition of the same title. 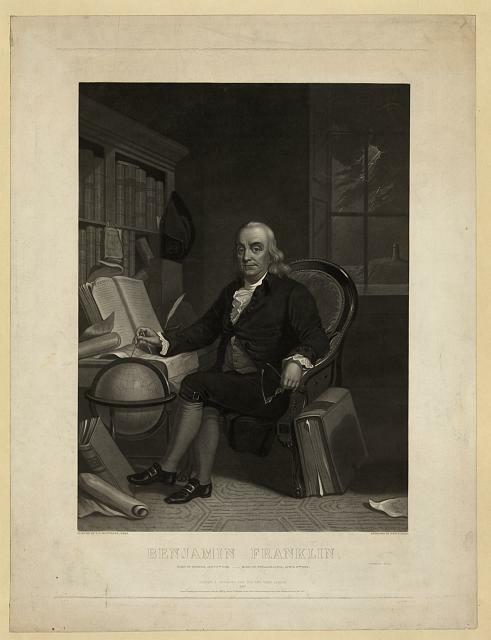 Exhibition content is arranged in thematic sections showing Franklin in the Boston of his youth, Franklin's family and personal life, as well as the years when he built his business as Philadelphia's premier printer. The exhibit also looks at Franklin's commitment to public service, his interests in medicine and public health, and his work in science and philosophy. Franklin's political career in England, France and the United States, and his contributions to the Declaration of Independence, the Constitution and other major documents are the subjects of the final two sections of the exhibit. Benjamin Franklin: In Search of a Better World was organized by the Benjamin Franklin Tercentenary, Philadelphia, and the American Library Association Public Programs Office. The traveling exhibition for libraries has been made possible by a major grant from the National Endowment for the Humanities: great ideas brought to life. The traveling exhibition is based on a major exhibition of the same name mounted by the Benjamin Franklin Tercentenary to commemorate the 300th anniversary of Franklin's birth. The Benjamin Franklin Tercentenary is a nonprofit organization established through a major grant from The Pew Charitable Trusts to educate the public about Franklin's enduring legacy. This project is supported by a grant from the Alabama Humanities Foundation, a state program of The National Endowment for the Humanities. Image of Benjamin Franklin painted by T.H. Matteson, Esqr. ; engraved by Heny. S. Sadd.